“Hello, sir, madam, and young lord and lass. Welcome to Petit Lyon’s fabulous festival,” greets a man with fine brocade robes and a large stick. Flitting around him is a girl with pointed ears and large transparent wings. These fine folks beckon you to enter the St. Louis Renaissance Faire. Past the entrance you will step back in time in an adventure the whole family will enjoy. The Faire nestles in Rotary Park, Wentzville, Missouri. In this sprawling state park countless paths lead to tents and wooden storefronts brimming with shining baubles. Items include chain mail, wooden shields, steel swords, jewelry, and elf ears. Each of these displays urges you to stray from the lanes for a quick look. Toys found here appeal to both the young and old. Shopping is only part of this historical experience. A cast of characters including pirates, Irishmen, and jesters will regale you with historically appropriate songs all day long. For those preferring action over music, cheer on your favorite knight on horseback at the three times daily joust. 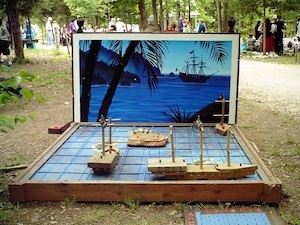 If you want to play, head to the throwing targets, rope bridges, and live chess throughout the grounds. Or watch magic shows and storytellers wow the young and young at heart. Don’t forget the well-dressed King and Queen. Become a part of the royal court by completing the knight’s and princess’ quests. Meet the locals — learn about weapons in the German encampment or cooking with the Scots. Fairies play mischief on bystanders in the fairy realms while gypsies weave stories at their wagon. 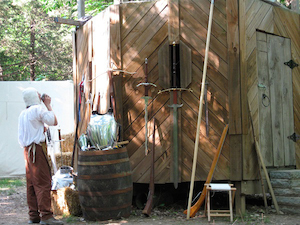 The St. Louis Renaissance Faire is interactive history and fun at its finest. The St. Louis Renaissance Faire (www.renstl.org/main) is every weekend and Memorial Day from May 17 through June 8 this year. Tickets purchased online are $12.95 for adults, $7.50 for kids under 13, and free for those under 5.